Sleeps 4. 2 bedroom cottage.South Hill is the end cottage of the set of three and has two very comfortable double bedrooms with memory foam mattress for extra comfort and televisions in both. Spacious open plan living, dining and kitchen areas with exposed beams and a vaulted ceiling. Modern wall mounted real coal effect electric fire, solid oak furniture in all rooms, tiled floors and wonderful underfloor heating throughout . Free WiFi. Good size fully tilled wet room, Toiletries and 100% Egyptian cotton towels. The cottage opens onto its own private patio at the rear - a real sun trap that is not overlooked by the neighbours cottage. Plenty of parking right outside front door. Stunning Views of the Somerset Mendip Hills and beautiful Somerset Countryside but only 3.5 miles from Weston super Mare. Set within five acres, Peaceful location an ideal choice for a great escape. Lovely cream tea on arrival! Fantastic cycling and walking and only 3.2miles from the sandy beaches of Weston Super Mare and quiet Uphill Sands and village are even closer. Ideal for exploring Brean, Cheddar Gorge, Wookey Hole, the beautiful Cathedral City of Wells, Glastonbury Tor, Bath, Bristol and Taunton . Great cycling and walking with the West Mendip Way on the doorstep and the start of the famous cycling strawberry line close by. Golf and fishing are available within the village of Bleadon , sailing, dry slope skiing and other outdoor pursuits are available locally. The Webbington Spa with its swimming pool, sauna, steam room and full gymnasium is only a few minutes away. We provide one free visit per adult per stay to use the facilities. Sorry no children under 16yrs and Sorry no pets. Changeover day, Monday-Friday. We moved to Lakeside Barns in Bleadon in 2002. This property was the dairy of the farm next door, which consisted of an old large grain barn, which is now our home and other outbuildings. Over the years we have slowly renovated, Knoll, Mendip and South Hill Cottage. Bleadon and the Somerset levels and Mendip Hills are beautiful, we love it here and its been worth all the hard work. We have both always wanted to live in Bleadon in Somerset, it is such a beautiful area. All our married life we have renovated properties and to find a barn conversion in the heart of Bleadon was fantastic. We are so pleased we have finished the holiday cottages so that now other people can enjoy this peaceful Somerset location. A real escape. While you are staying at Lakeside Barns the one thing you will notice is the lack of noise. At night apart from a hooting owl or call from a fox there is just wonderful silence. All the properties have outside lighting but because there are not any street lights you can really appreciate the illuminating night sky. We now have a seating area by our large duck pond, looking out onto the views and paddocks, a perfect place to sit and unwind with a morning cup of coffee or evening glass of wine. Large wet room with walk in shower, WC, wash basin and underfloor heating. Underfloor heating throughout cottage. Modern wall hung electric fire in lounge area. At the Webbington Spa included in the free day pass. Notes on accommodation: One free entry per adult included to use the facilities at the local Webbington Spa which has a Swimming Pool, Sauna, Steam Room and full Gymnasium. Private parking to all properties. Free WiFi internet Cream tea on arrival Sorry no children under 16yrs Sorry no pets Change over day, Monday-Friday Outside: South Hill and Mendip have private patio areas with their own access. Also available is a lovely grassy area with picnic tables by a large duck pond with views across the famous Thatcher cider orchards , surrounding Mendip hills and paddocks where you will see our miniature Shetland ponies, Hampshire down sheep and of course the ducks and geese. A perfect place to unwind and enjoy this peaceful rural setting. Well equipped,comfortable and welcoming plus scones jam and cream on arrival! Ideal positioned for visiting various locations ,only downside was the weather ,miserable and gale force winds. The cottage is lovely and comfortable everything you need and it was nice and warm when we arrived after a chilly journey. Trudy is always so cheerful and kind. We wanted a peaceful rural setting and we certainly got this. From the very warm welcome by Trudy and Paul to a very well thought out cottage we immediately felt at ease and very comfortable. We used the cottage as a base for visiting friends and relatives in Penarth and Bristol as well as meeting up with others locally. Bleadon has a very strong sense of community and is a very friendly place. We enjoyed the café and used the village shop. The Queen's Arms in Bleadon was great for both lunch and (especially) dinner. We also recommend the well judged food at the Oak House Hotel in Axbridge- a charming village nearby with an historic and continental feel. 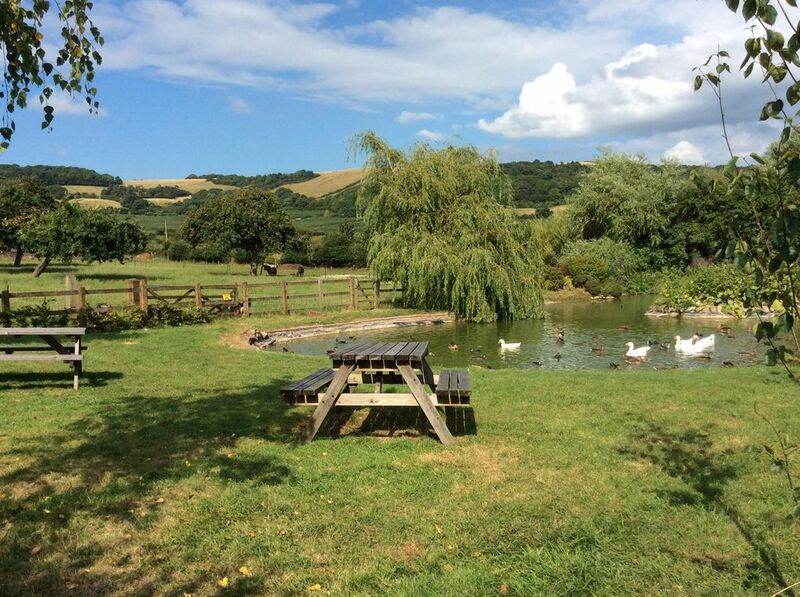 The relaxed environment at the Lakeside Barns, together with the beauty of the Mendips and the pleasure of the farm animals made this a perfect stay. We intend to return! we had a great week at lakeside.accomadation perfect everything you need.easy access to great locations and we were well looked after by Trudy.would recommend this as a holiday retreat.very clean,comfortable with a really nice cream tea on arrival.would not hesitate to rebook if we are in somerset again. Only 3.2 miles from the sandy beaches of Weston Super Mare and town and quiet Uphill Sands and village are even closer. PLACES TO EAT; Within 3miles of Bleadon there are a selection of great local pubs and eating houses. Only 1.5miles away we have the Indian masala and within Weston super Mare 3.6 miles, there are many different restaurants to choose, from fish and chips, Indian, Chinese, Japenese, Italian, Greek to A la carte. Only 5 miles away is Axbridge on the way to Cheddar. A very pretty historic town with a medieval square in the centre where you will find, The Oak House restaurant, The Lamb Inn and The Crown. BS26 2AJ.